The most excited I’ve ever been about getting a restaurant reservation was when the people at El Bulli emailed me to say that I had secured a table. The excitement of getting a reservation at Dinner by Heston Blumenthal at the Mandarin Oriental came close, except this time I managed to control my screams of euphoria. The restaurant receives about 6,000 phone calls a day and is now booked out until the end of June. 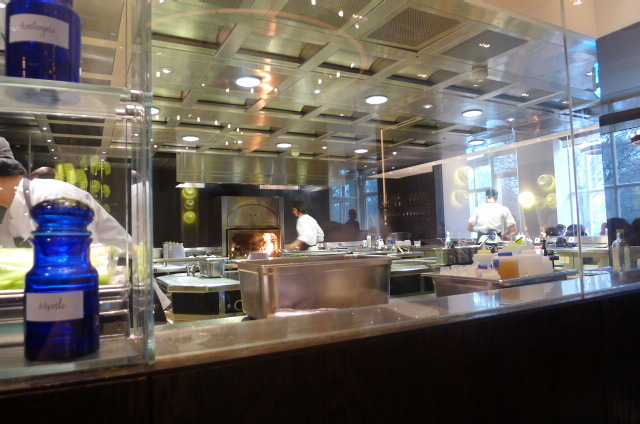 The arrival of Dinner by Heston Blumenthal was highly anticipated and it has to be the hottest opening of 2011. It is so hot that reservations are being traded on ebay. 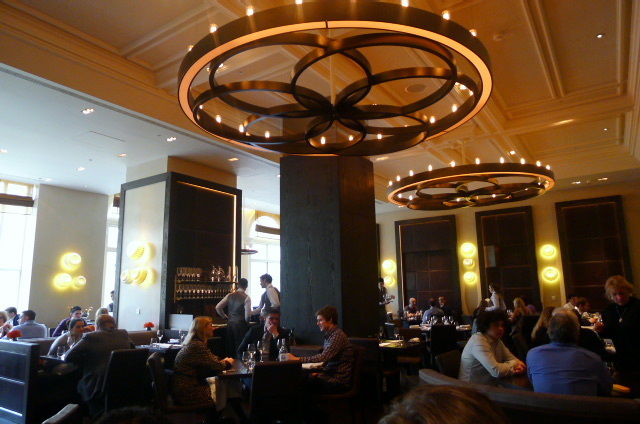 An Adam Tihany design, the restaurant is beautiful with dark wood panelling and leather furnishings. The previous occupant of this space was Foliage, which Tihany also designed. It’s airy and light, and the high ceilings give it an incredibly spacious feel. It’s also elegant but relaxed, and there’s a touch of mischievousness and fun to the room with the use of some cheeky jelly-mould lights. The kitchen is an open one providing diners with a look-in, but that’s if you don’t find yourself getting distracted by the fabulous views of Hyde Park. The inspiration for the food came from Heston’s TV series ‘Feast’, where Heston went back into the culinary archives to revive long forgotten historical British recipes. The food at Dinner has been adapted for modern consumption, with each dish on the menu being referenced to the period and the cookbook from where the inspiration was drawn. 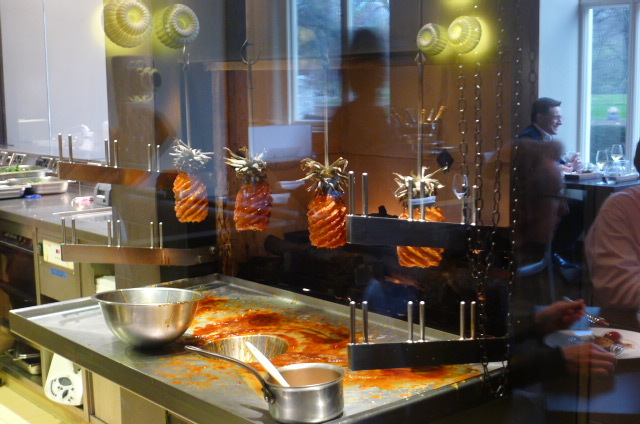 This may not be television, but the restaurant still invokes a sense of drama. 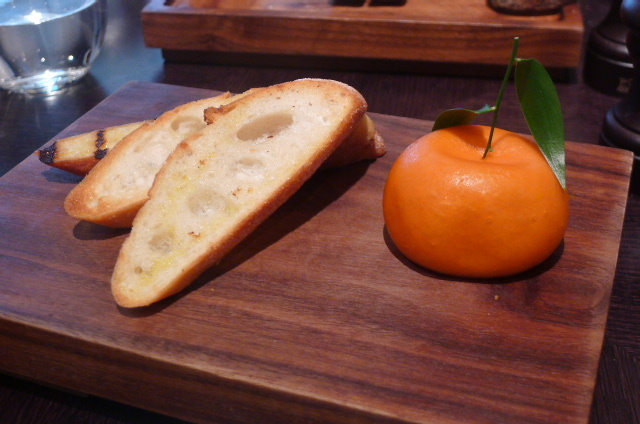 Take for instance the famous meat fruit (£12.50 – circa 1500) which I loved, loved, loved. A chicken parfait, it is so named as it resembles a mandarin with its thin coating of mandarin jelly made from mandarin oil and paprika (for colour). Served with grilled sourdough bread, the parfait was light as a feather, creamy, and divinely delicious. Rich with flavour, it was also insanely fun. The meat fruit looks incredibly real, and it was almost surreal to cut into something that looked like a piece of fruit, but which tasted like chicken parfait. This dish will surely be immortalised as one of the greatest classics of all time. 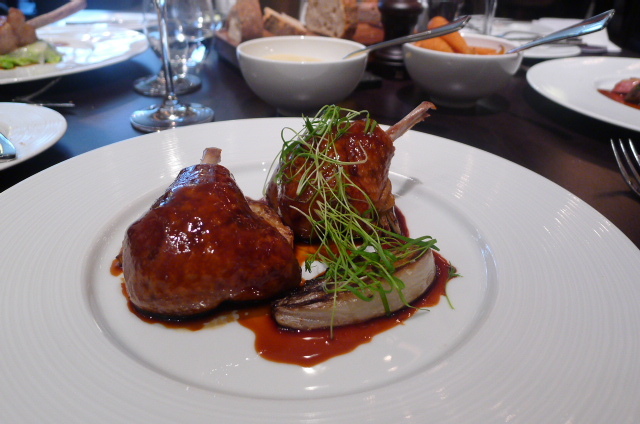 A broth of lamb (£12.50 – circa 1730) was also stunning with its depth of flavour. 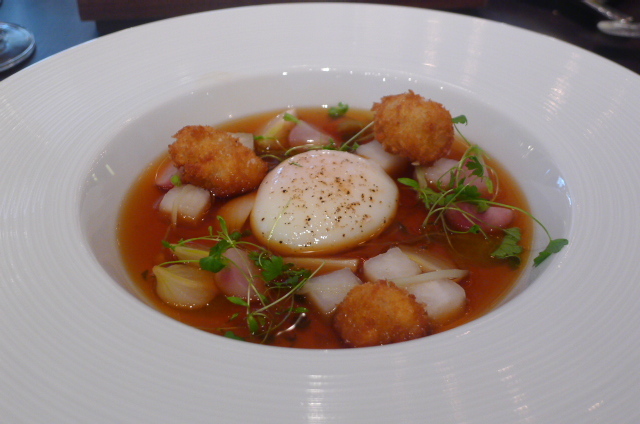 At the core of the dish was a slow cooked hen’s egg, its runny goodness combining wonderfully with the intensity of the consommé. Also immersed in the broth were some diced celery, radishes and turnip, and some tasty deep-fried crumbed sweatbreads. 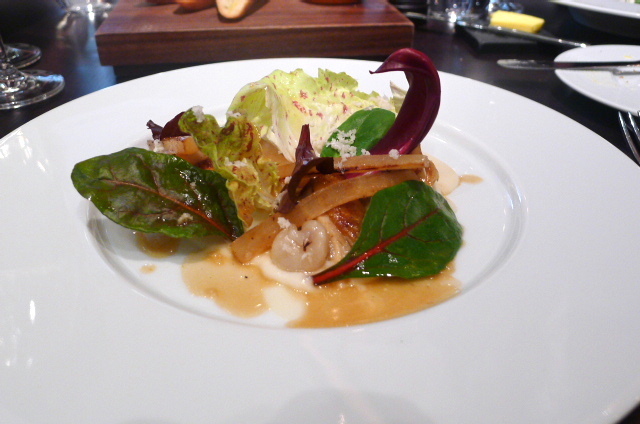 Salamugundy (£12.50 – circa 1720), a dish of chicken oysters with bone marrow and horseradish cream, was lovely. The bone marrow provided a terrific richness to the dish, and the excellent horseradish cream, which was both light and creamy, worked well to balance out the plate. There was also some nutty salsify thrown into the mix. 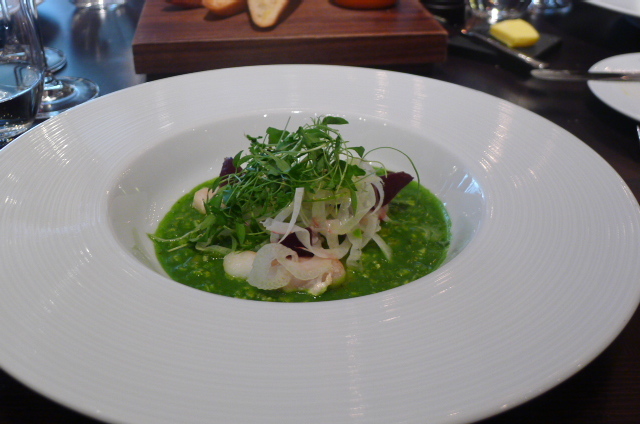 A savoury porridge (£14.50 – circa 1660) containing cod cheeks, pickled beetroot, shaved fennel, garlic and parsley erred on the acidic side, but the combination of ingredients worked well together. The cod cheeks were impressive for their meatiness. Mains were flawless and delicious, but lacking the ‘wow’ factor, were less inspired than the starters. A sirloin of black angus steak (£30 – circa 1830) came with few gimmicks. A simply presented piece of meat on the plate, it was nevertheless meltingly tender and flavoursome. 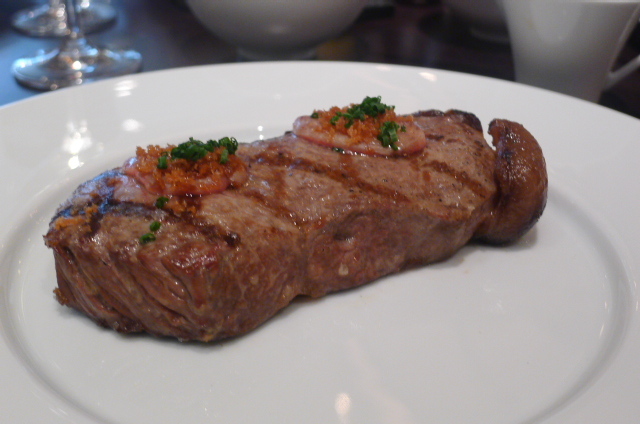 For added spark, the steak had been topped with slivers of scrumptious bone marrow finished with crunchy breadcrumbs. It came with some of Heston’s famous triple cooked chips, red wine jus and mushroom ketchup. 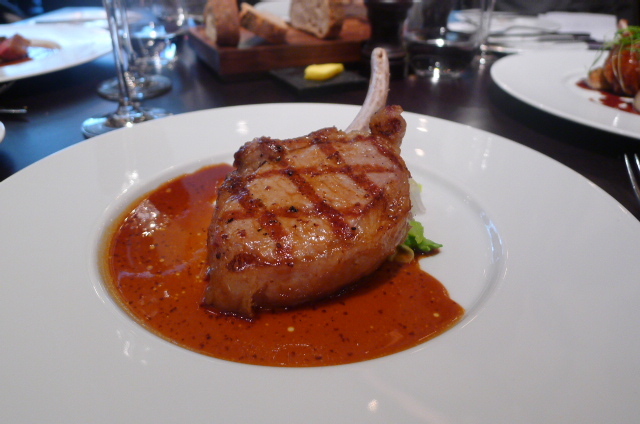 Also excellent was the flavoursome black foot pork chop (£28 – circa 1860), the black foot being in reference to the ‘pata negra’ Spanish pigs typically used for Iberico hams. Served with crunchy cabbage, it was finished with ‘Robert sauce’, a concoction made with Alsace bacon, wholegrain mustard, thyme and garlic. A spiced pigeon (£32 – circa 1780), slow cooked for two hours with cardamom, star anise, ginger, garlic and all spice, was astoundingly tender. Its loveliness was counterbalanced by the earthy nuttiness of braised artichokes and some ale. The word ‘powdered’ relates to an ancient word for salt curing, and in a dish of powdered duck (£24 – circa 1670), it referred to the way in which the duck had been slow cooked for nine hours, leaving it moist and flavoursome. 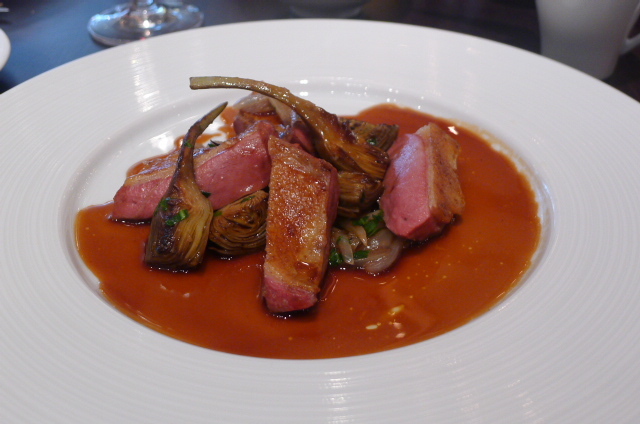 The accompanying fennel, smoked and finished in duck fat, provided a lovely contrast to the richness of the duck. Customers are advised to order the signature tipsy cake upfront if they wish to have it as a dessert. The result is a glorious brioche filled with a dreamily delicious cream, served with a piece of pineapple which has been spit roasted and basted with sugar syrup for two hours. 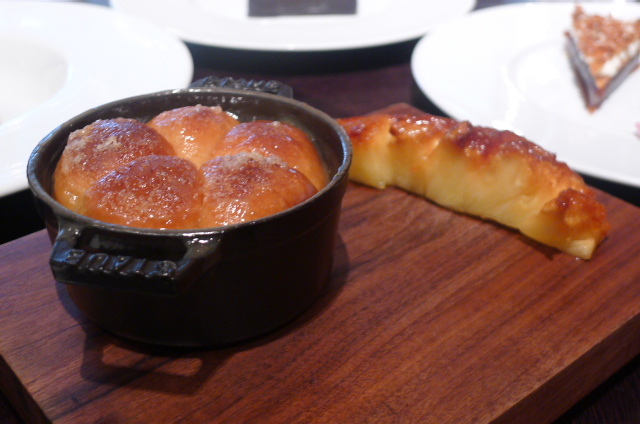 I enjoyed the pineapple, but it was the brioche that won my heart with its lovely comforting goodness. 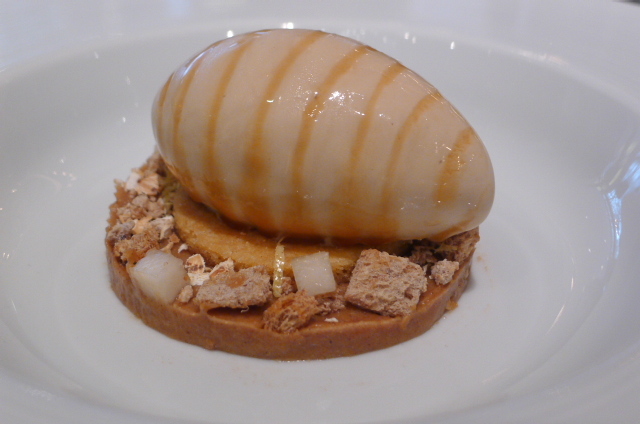 Brown bread ice cream (£8 – circa 1830) delivered the wow factor. Tasting just like brown bread, the flavour of this not-so-sweet ice cream is accentuated by a to-die-for salted butter caramel and malted yeast syrup. 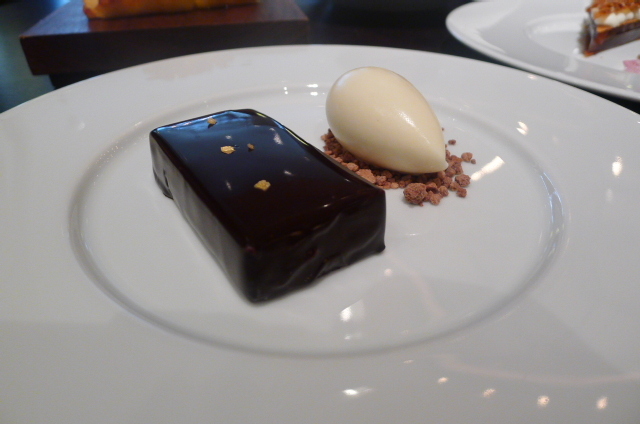 A chocolate bar with a chocolate ganache and passion fruit jam centre was intensely rich and would have satisfied the most die-hard chocolate lovers. Served with ginger ice cream, it was surprising for its lack of ginger flavour, although this may have been because it was overpowered by the intensity of the chocolate. A taffety tart (£8 – circa 1830) was a work of art with its technically complex layers of apple, fromage frais and pastry. Served with a fennel and blackcurrant sorbet and rose petals, the fennel was highly fragrant, giving this dessert a hint of exoticism. A highly artistic creation, it wasn’t quite as satisfying as the other desserts. 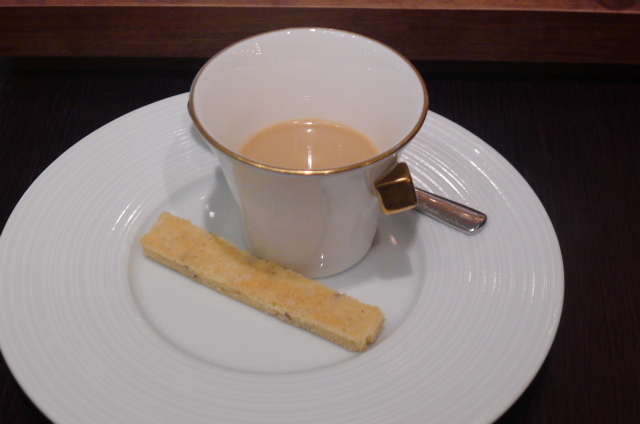 To finish was a lovely complimentary Earl Grey ganache with caraway shortbread. The service was extremely friendly and approachable, and we fell in love with our South London waiter from Bermondsey who was extremely knowledgeable and professional, yet easy going. There isn’t an ounce of stuffiness here – table clothes are not even used – and this down to earth approach makes Dinner seem accessible to all, even if its home is the 5 star Mandarin Oriental. Despite this, there were occasional lapses in the service such as forgotten side orders and water requests which left obvious room for improvement. This meal was enthralling. Everything was flawlessly cooked and incredibly flavoursome. The mains were less exciting than the rest of the meal, but then, starters such as meat fruit and desserts such as tipsy cake were hard to beat in terms of the enchantment factor. Ashley Palmer-Watts may be the head chef – Heston’s sous chef from The Fat Duck – but Heston’s trademark wit, charm and brilliance was stamped throughout the meal. It’s far less molecular than The Fat Duck, so it’s the type of food that will easily appeal to everyone. I loved this homage to British cuisine. It’s a special place. Get a booking if you can. Price range: £41 – £62 for three courses. There is also a reasonably priced 3 course lunch menu for £28 on Mondays to Fridays. Excludes drinks and service. For Gourmet Chick’s review on Dinner, click here. Also to check out Londoneater’s review, click here. Where is the best place to dine in Central London? Yeah, I definitely think I need to go back and try some more of the dishes. Think I made a mistake not having the Meat Fruit first time round! I loved loved loved my meal here. What made it sooo special was the lack of pretension in the service. It made me so proud to be English. 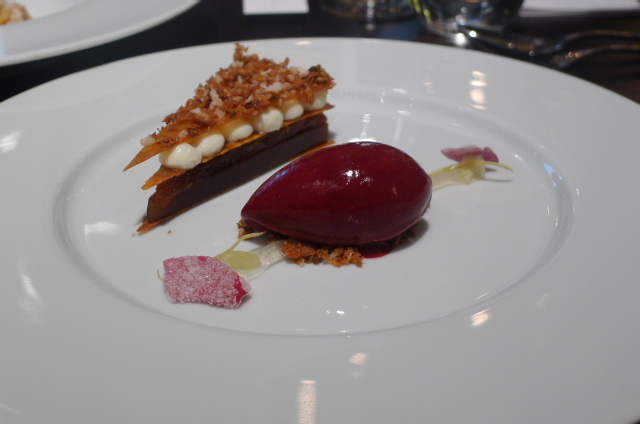 Heston deserves a medal for the care & research that’s gone into the compilation of the menu. I’m afraid to go back, just in case it’s not as good second time round. Beg borrow or steal to get a table. OMG please take me here sis! Looks unreal! Yeah you definitely have to go back and try the Meat Fruit. It is a very special dish. I know what you mean about being worried about going back again and it not being as good the second time around, but I would definitely take the risk! I would love to take you but reservations are really hard to come by. I will do my best though! Ah thanks for the link. Glad you managed to get a booking and enjoyed it as much as I did. Am looking forward to when they launch their afternoon tea menu! On my way there tonight, having given up an earlier booking when it first opened (devastating) – so excited!